Newtown History Center staff will present the program at your school wearing period costume representing what common people wore in the early 1800s. They will illustrate curriculum points with reproduction period maps that students will learn how to read and will use to plan immigration and transportation routes just as travelers and emigrants would have in the late 1700s and early 1800s. This Program is designed to assist teachers in their instructional efforts with students who are in the Virginia Studies and United States History to 1877 units of the Virginia History and Social Science Standards of Learning. The presentation will include discussion of the Shenandoah Valley as a geographic corridor for early American immigration to the South and West. 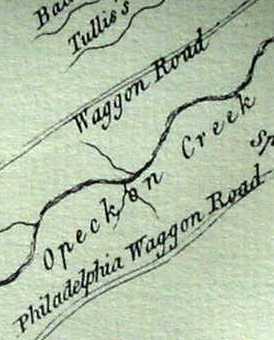 Students will be able to see how early Americans perceived the region through maps (sections VS.1.i, VS.2.b and V.S.6.c) and the role that the Great Wagon Road played in the early American westward movement. Limitations of early transportation technology and the difficulty mountain ranges posed to travelers will be discussed. The program will also address the features of trans-Appalachian geography (US1.2.b & c) that early American immigrant to the West would have found desirable.